PHILIPSBURG – The shipyards of SeaCure Marine in Simpson Bay contain nearly twenty fiberglass yacht wrecks which are awaiting their turn to be crushed. They were salvaged after hurricane Irma. “When one of those ships gets crushed, where am I supposed to bring the material?”, asks Jens Plage, a salvager for SeaCure Marine. The dump doesn’t accept fiberglass waste because it can be dangerous to the environment. Especially if the dump catches fire again. 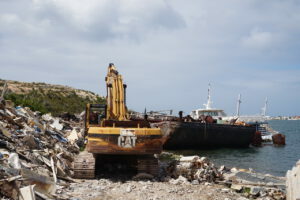 SeaCure Marine is one of the three companies in Sint Maarten that received a permit in 2018 to salvage ships which had washed ashore or had sunk in the Simpson Bay Lagoon. Ships that could be saved have already been repaired or have been sold by the owners or insurers. The Sierra Romeo, the biggest ship that SeaCure salvaged with the assistance of another company, a mega yacht worth between 20 and 40 million dollars, was brought to the Netherlands to be refitted. A different vessel, the Jab Jab, was deliberately not repaired. The Sint Maarten Nature Foundation sunk the ship in September 2018 to create a new reef habitat. Metal ships that were written off by insurers still had scrap value and were easily processed. A lot of fiberglass vessels are still waiting to be processed. SeaCure Marine found a company in the Dominican Republic that was interested in crushing up the fiberglass boats to turn them into fiberglass pellets which could be used again. “But that didn’t happen due to import regulations”, says Plage. The costs of salvaging a ship vary per ship; it depends on the location and if the ship washed ashore or if it sank. According to SeaCure Marine the costs vary between 6,000 and 60,000 dollars. This amount gets paid by the owner or the insurer, depending on the size of the ship. That’s the problem with a lot of the vessels that are still stranded or that sunk in or around the lagoon. “They weren’t insured, or the owners don’t have the money to pull them out of the water. Some of them just left”, according to Plage. For those wrecks, the Ship Salvage and Removal plan was announced this week. It is part of the Emergency Debris Management Project of the reconstruction effort. The almost one hundred ships on the Dutch side have to be processed according to international environmental standards, says Mark Williams. He is a policy officer at the Ministry of Public Housing, Spatial Planning, Environment, and Infrastructure and is the spokesperson for the reconstruction effort at this Ministry. After six weeks the owners will lose their rights to the ships and the public tender process for the salvage works will begin, with work to start in July. Vessels that were previously salvaged and the debris on the shore of the lagoon will also be taken along in the process. The material will most likely be shipped to a processing plant. How long will it take? “We estimate 150 days but it could be more or it could be less. The work still has to be put out to tender”, according to Williams.